The Passaic County government unveiled a plan on Tuesday afternoon to replace the deck of the Wayne Avenue bridge over the Passaic River in the summer of 2019. Cost to replace the deck is approximately $4 million, according to Passaic County officials. A major part of the project involves making a series of improvements to accommodate an influx of tourists to the Great Falls National Historical Park. Passaic County freeholder John Bartlett said the renovated bridge will feature open balustrades, historic lighting, and wider sidewalks on both sides. He said the sidewalk facing the waterfall will be twice the current size. Four lanes will be reduced to three on the bridge to improve pedestrian safety. “You see what the bridge looks like now, but there is more to a bridge like this than just making a path over the water. This bridge is part of how visitors and residents alike experience Passaic County, Paterson, and the Great Falls,” said Bartlett. Constructed in 1932, the bridge is categorized as “functionally obsolete” and “structurally deficient,” according to the county’s grant application to the state. The project is being funded by the county and the state. 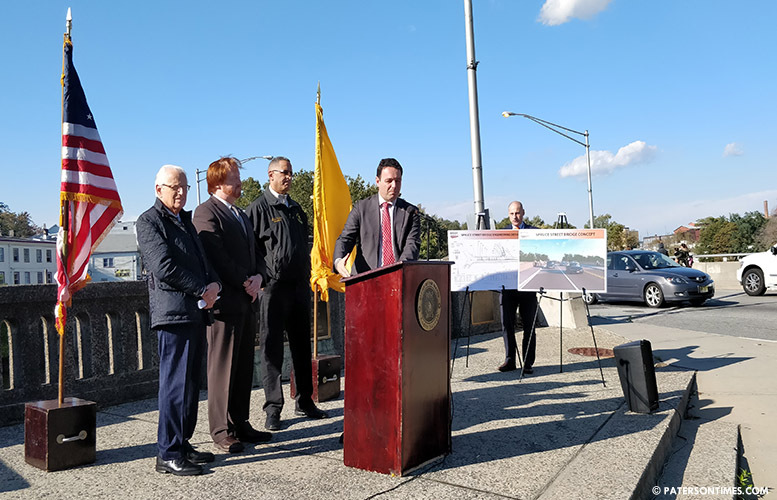 $3.7 million is coming from the New Jersey Department of Transportation and the rest from the Passaic County government, said county engineer Jonathan Pera. “This will be more walkable. I think about the Great Falls Festival. I’m thinking about the Labor Day Parade. I’m thinking about how vibrant this area could become,” said mayor Andre Sayegh standing on the bridge at the corner of Wayne and McBride Avenues. “We’re going to make a 21st century bridge that reflects the historic nature of our area, the lighting, the structure” said congressman Bill Pascrell. The Passaic County government has been talking about replacing the Wayne Avenue bridge for the past four years. Pera said work will begin in summer 2019. He said one lane will remain open each way while the bridge is being renovated. He said one sidewalk will be open at all times. The county has $1.2 million for a second project to improve Spruce Street from Wayne Avenue down to the Paterson Museum. It includes replacing the sidewalks, said the freeholder. Bartlett, who sits on the North Jersey Transportation Planning Authority, secured $3.5 million for a third project to upgrade Market Street from Spruce to Madison Avenue. By the time all the bribes and kick backs are taken into account the cost will be triple.